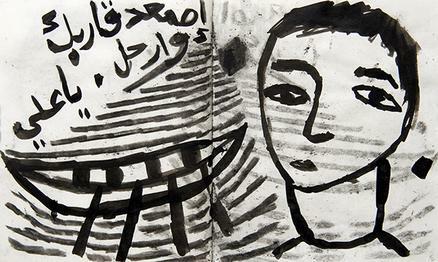 Sadik Kwaish Alfraji is part of Moving Stories: Three Journeys, a new multimedia exhibition at the British Museum. A selection of drawings from Alfraji’s Ali’s Boat series is featured alongside a projected animation of million-year-old footprints discovered in 2013 and a short film by the late poet and philosopher Édouard Glissant. Before travelling to the British Museum, Alfraji’s series was highlighted in solo exhibitions in the Middle East and Europe between 2014 and 2016, including at the Red Star Line Museum in Belgium. According to the British Museum, ‘The show provides space to reflect on the similarities and differences between epic and transformative journeys—sometimes separated by millions of years but connected by our shared humanity.’ Ali’s Boat is the centrepiece of the exhibition, which is on view from 30 March until 30 April 2017.